Maille, or mail, or chain mail (as popular culture and web search engines call it) was the #1 armor from Roman times up through the 14th century, and was still used on the battlefields of eastern Europe and central Asia well into the 20th century. 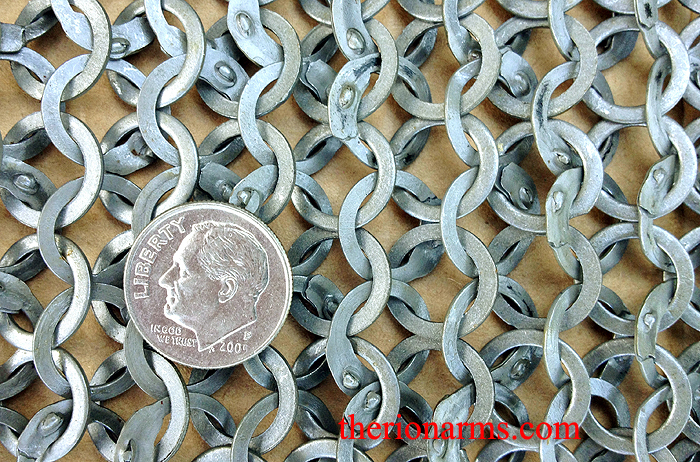 The term "chain mail" is a Victorian misnomer that comes to us from Sir Walter Scott's 1822 novel 'The Fortunes of Nigel'. Many academics and reenactors and academically-minded reenactors prefer to simply refer to linked-ring armor as "mail", but many (myself included) prefer to use the French spelling "maille" just to differentiate the armor from the postal and e- systems. 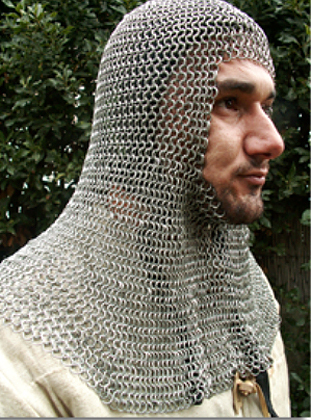 Wikipedia has a good article on maille armor here. TherionArms is proud to present a wide variety of riveted maille armor: hauberks, haubergeons, coifs, aventails, standards, voiders, and skirts in various types/styles/grades. The various grades are name-ranked with historical titles for convenience, but this does not in any way reflect upon the historical usage. Pardon the stock photos above. Fresh pictures of this coif will be coming soon.